There’s nothing “democratic” about socialism. This is a nonsense line, delivered to useful idiots, to get them to assist tyrants in their endless attacks on liberty & freedom. Spain is now governed by socialists. Spain doesn’t need “the right to whip up fear”. Anyone who is not concerned about the invading savages hasn’t got his faculties in tact. Migrants rescued at sea wait to be transferred at the harbour of Algeciras. All men. No women or children. It’s an invasion and the left wing Spanish government are enabling it. The fan that stirs the humid air in José Villahoz’s small office does little to dissipate the heat, the fatigue or the frustration. Another summer is upon southern Spain and once again the perilous pateras (small boats) are arriving on a daily basis, once again the reception system is creaking under their weight, and once again, Villahoz says, the warnings of all the previous months and years have gone unheeded. The only thing different about the summer of 2018 is the surge in the number of migrants and refugees arriving – 27,000 and rising, mostly by sea – and the political reactions that have greeted it. Thirty years after Spain was first shocked to find the body of a migrant washed up on its shores, and scarcely six weeks after the new government took in 630 people on the rescue ship Aquarius who had been turned away by Italy and Malta, some rightwing politicians have begun to talk of identity papers, more border controls and “millions of Africans” wanting to come to Europe. In a country that has traditionally been pro-immigration and devoid of a significant far-right party since its return to democracy, their words have raised eyebrows and concerns. “The first thing we need to be clear about is that there’s a bit of unwarranted alarm over the arrivals we’ve seen over the past month,” said Villahoz, president of Algeciras Acoge, the local branch of an Andalucian NGO that works to protect, educate and integrate migrants and refugees. That’s a tall order. They should be concerned to protect the natives from the invading savages. Europe has no business to educate savages. These are undesirable, unassimilable Africans who can never be integrated. Why even bother? The politicians in question are Pablo Casado, the new leader of Spain’s conservative People’s party (PP), and Albert Rivera, who heads the rival Citizens party. 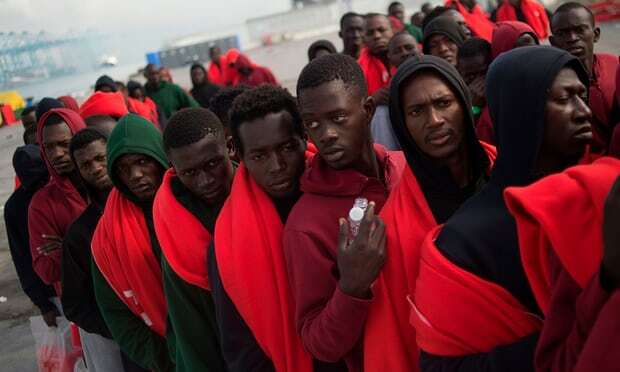 Rising migrant numbers and the recent storming of the border fence that separates Morocco from Spain’s north African enclave of Ceuta appear to have persuaded both parties that immigration could be shaping up as an issue in the general election that must be held by July 2020. PP party leader Pablo Casado speaks to a member of the Spanish Civil Guard during a visit to the harbour of Algeciras. Rivera, meanwhile, accused Pedro Sánchez’s socialist government of double standards when it came to the situation in Ceuta and the welcome afforded the Aquarius when it arrived in Valencia. Despite the recent warning by José Ignacio Landaluce, the mayor, that Algeciras could become “the new Lampedusa” there are few, if any, signs of the migrant influx in the port city, with its hulking cranes, palm trees and occasional German or Chinese tourists. Most of the new arrivals are taken straight to the sports centres that have been pressed into service as makeshift police stations and then sent elsewhere in the province. But the question is how long that solidarity will last if immigration becomes a serious issue at the ballot box and if rightwing parties shift further to the right. Carmen González Enríquez, a senior analyst at the Real Instituto Elcano thinktank, argues that Spain’s experiences and memories of the Franco dictatorship have so far served to inoculate it against the extreme right. After the transition, she added, that nationalist discourse was rejected. While acknowledging that tensions exist in some areas that could give rise to a xenophobic party, González Enríquez said that the group that most closely fitted the bill – the tiny far-right Vox movement, formed five years ago by disgruntled former PP members – would struggle to attract enough votes to get into parliament were a general election held right now. Pablo Simón, a political scientist at Carlos III University in Madrid, saw parallels between the current situation and the events of 2006, when another PP opposition attacked another socialist government for failing to manage immigration as thousands of people arrived in the Canaries. He also saw the recent rhetoric from Casado and Rivera as part of the public skirmishes between the PP and Citizens as each party tried to establish itself as the bona fide voice of the Spanish right. “What we don’t know yet is whether this is part of a temporary positioning to criticise the government – in which case it’ll vanish from the media map in September or October when the Catalan issue comes round again – or whether it’s a strategic turn by the PP that Citizens will also react to,” he said. Albert Rivera of the Citizens party has accused the Spanish government of double standards over its attitude to migrants. Amparo González, a migration researcher at the Spanish National Research Council and a member of the group Economists Against the Crisis, was not surprised by this year’s numbers. “Last year, there were 28,000 people and in 2016 it was half that,” she said. “This has been the tendency over the past 20 months and it’s no surprise to anyone who follows this.” She attributed the surge to the good summer weather; the closure of other European routes, and a lax approach from Moroccan authorities who were keen to get the measure of the new Madrid government. González also criticised Casado for his comments, noting that government figures showed that only around 500,000 Africans have settled in Spain over the past decade. 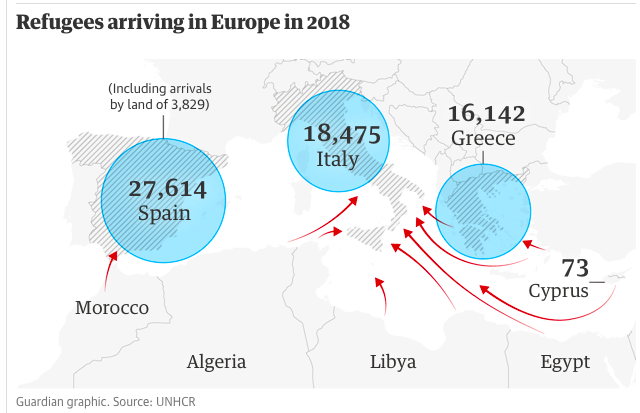 By the autumn it will be clear just how many people reached Spain during the peak arrivals season – and whether the numbers will have enduring political consequences. Like most of those who work to help migrants and refugees in Spain, Villahoz is depressed by successive governments’ refusal to engage with the reality of the situation and to treat the issue as a humanitarian imperative rather than a policing challenge. If the Sánchez government could welcome the Aquarius and its passengers into Valencia, he said, why couldn’t it do the same on the south coast, where “we have Aquariuses every single day”? Previous PostThe War Against Tommy RobinsonNext PostCanuckistan: Hijab tuggery is the greatest problem! As an insurance company, government IS enforced victimology: taking from the able to give to the (hopefully only temporarily) disabled victims. After a while, though, and based on the fallacy of modern education, which seeks to discover why, not how, people do the things they do, it’s ever-expanding list of who constitutes a victim class now includes “everybody!” and even those who are physically able, yet unwilling to work, are classified as being “depressed” and suffering from “mental illness” (as being helpless victims of their own mysterious yet somehow also inevitably-forced emotions)! This is how individualism becomes collectivism – as if deferring one’s free-will rights and responsibilities to self-determination over to a group or gang of equally fallible humans pretending to be superior “authorities” has ever, will ever, or can ever really work out in the real world! How is a gang of victims less so than only one?! Raised “enslaved” by parents who controlled everything, treated like a criminal and prisoner in school, they don’t know anything else and can’t imagine ever owning anything! The only dream they have is to rise to the top of the socialist crime-gang to extort more from the Makers! When you don’t earn anything, its easy to give it all away. ALL power-trading politicians are professional hypocrites and traitors. Democracy – even direct democracy – is slavery, because it presumes you must give up your right to control your own stuff to groups of other people. Well, “So do we too have a right to vote for the fate of your stuff!” says the Majority of other people! Why should anyone else have any rights to control any of your property? Why should you be responsible to them?! Why should criminals be allowed to vote to “progressively” legalize crimes at all, ever?! To vote against logic and reason?! We only need The Golden Rule of Law – having the responsibility to not attack, and the right to not to be attacked, first. No further legislation is needed, beyond delineating the boundaries of one’s contractually negotiated property. No “authority” is needed, beyond enforcing one’s property rights. A (very!) limited “monarchy” would satisfy this criteria. And with it, taxes could be reduced to almost nothing. Otherwise, libertine “liberal” criminals get to incrementally, “progressively” legalize all crimes through “democracy,” while it also remains blazingly obvious that if and when one gives muslims “democracy” they WILL vote – for MORE ISLAM!